- A single consolidated view to all available resources regardless of the location. - Efficient access to manage those resources and to reduce operations and systems management costs. - Dynamic response to application needs. - A competitive advantage when gathering and accessing information across the organization. The IBM Virtualization Engine addresses the virtualization aspects of the On Demand infrastructure. 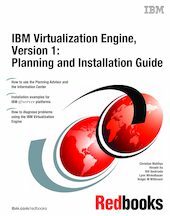 - Plan and prepare the installation of the IBM Virtualization Engine Version 1. - Install the IBM Virtualization Engine Version 1 for each type of IBM eServer. - Use the IBM Virtualization Engine Version 1 to address customer pain points.